. The Sun's Astrology: The Sun is concerned with the solar, or outward aspects of the self, and renewed vitality after the dark night of the soul encountered under the Moon. The Hebrew letter for the is Resh, meaning the head and also success. On the Tree of Life, the Sun appears on the twentieth pathway between the spheres of Yeshod and Hod. Yeshod governs the moon and the unconscious mind, and Hod is the sphere of the rational mind. 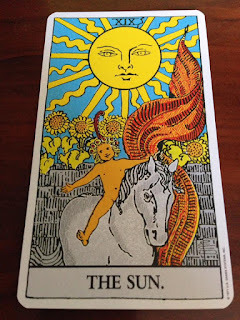 The Sun integrates these two aspects, suggesting happiness and spiritual growth. 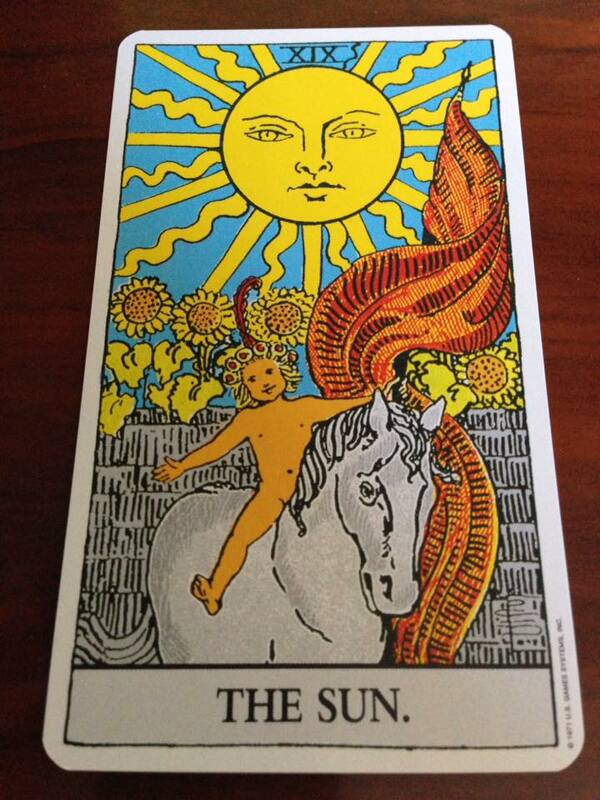 The Sun brings success and achievement and is one of the most positive cards in the major arcana. If you have had a challenging time, the Sun shows that every aspect of your life will improve. You will also enjoy more energy. The Sun:The Sun is a symbol of consciousness, happiness, and self expression. The solar power of the Sun signifies energy and good health. The Child: Simplicity, innocence, purity and wholeness-These are all elements of the happy inner child. The child has six small flowers in hair in the spirit of celebration. The Sunflowers: Growth, beauty and strength-The sunflowers grow tall above the level of the wall, reaching upward to see what is beyond the boundaries. The four sunflowers may symbolize the four elements of Air, Water, Fire and Earth-everything that is needed for life. As the sunflower when young turns its head to capture the sun throughout the day, so this tells us the search for light is our true nature. The Walled Garden: Boundaries, security, and protection. The White Gray Horse: He represents the vehicle for our soul-the physical body. The Red Flag: Illustrates energy and vitality. The Red Feather: Represents Life Force.